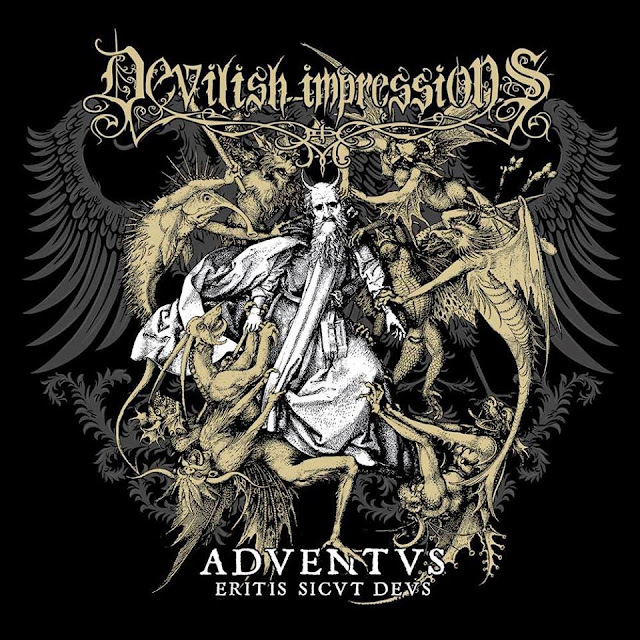 Here we are to present and review "Adventvs - Eritis sicvt Devs" album from the Polish extreme metal experimentalists Devilish Impressions! The new album reveals both, primordial and modern sound of the band, combining 2 new powerful tracks with their first recorded and never published before material from "Eritis sicvt Devs" EP. The musical distance between both (old and new) is quite big, the technical skills, details and "know-how" achieved through the years has put the band among the top of what is being done on the Polish black death metal scene! This album is for sure a must have piece for the fans of the band and not only, here you can check the foundations of this mighty modern and extreme metal band, a band that never stop impressing their listeners with an ever-growing musical formula, forging within the years a true solid identity! The darkest beauty and the beast combined in such delightful right proportions! A must have album for fans of bands such as Satyricon, Dimmu Borgir, Arkhon Infaustus, Behemoth, Ancient or even Limbonic Art, Emperor, Burzum, Mayhem, Arcturus in their "Eritis sicvt Devs" period! The true light has arrived! Deny the enslaving cross and embrace a life of freedom, be the leader of your destiny and adventure yourself to be your own God! Wojciech ‘Flumen’ Kostrzewa (Asgaard) - additional synth / fx. 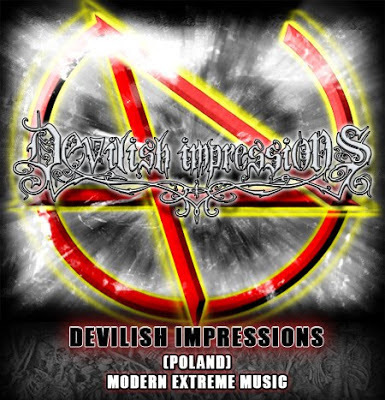 Devilish Impressions are considered by many as one of Poland’s leading and most innovative modern extreme metal acts. The band started their dark path in the year 2000 as a three-piece, featuring the only actual remaining member, the bands singer / guitarist and mains lyric writer Quazarre. You can read more about the bands origins and experiences across the first pages of this album booklet! Since the primordial times of experimental black metal the band has been developing their own sound release after release, this has allowed the band to reach a respectful status on today's day's competitive Polish extreme metal scene. Experimental and modern, the bands black death metal is an artistic expression of pure genius and years on this extreme musical field! Devilish Impressions have forged their careers strongest step forwards with the release of the acclaimed "Simulacra" masterpiece in 2012, by then, the band sound has reached elite levels of metal extremity and dynamism! Something the band decided to develop even more on the two new tracks of "ADVENTVS ..." piece. Keeping the use of synthesisers to the minimum, introducing 7 string guitars and using no drum triggers at all, the band has developed their melodic dark sound and created an heart-pounding black force that shall piece your ears in a dark devilish way! A modern extreme metal sound that shall please adepts of bands such as Satyricon, Dimmu Borgir, Arkhon Infaustus, Behemoth, Ancient, just to mention few! The bright incursion of some oriental folk instruments is just another great addition to the bands top-quality sound that has been achieved by the band and the famous Arkadiusz "Malta" Malezewski (Behemoth, Decapitated, Hate, etc.) this time the band has used several recording studios to produce the new songs, including the famous Hertz Studio (drums, Wieslawski Bros), Icaros Studio (guitars), Flumen Studio (additional synth / fx) and Sound Division Studio (vocals; guitars’ re-amping). “ADVENTVS - Eritis sicvt Devs” reveals the bands new and old sound. While the new is way more technical and blends wisely with some death metal elements, in the other hand the primordial Devilish Impressions sound is quite experimental and way more atmospheric, a sound deeply influenced by old-Norwegian black metal. The influence and homage to bands like Limbonic Art, Emperor, Burzum, Mayhem, Arcturus, Abigor can easily come into the listeners mind while listening to the bands early endeavours! Devilish Impressions have kept their fans captive by their own sound since their early foundations, much due to the fact that they always had the genius to overcome themselves and never copy these or that band, the forging of their own identity allowed the band to grow stronger and reach each day new horizons! Quazarre ( check also Asgaard, Crionics) is without a doubt the genius mind behind Devilish Impressions main musical art, creating impressive and cult lyricism, outstanding clean as well as destructive vociferated vocals, he is also responsible for the bands impressive guitar leads and structures! This album shows how his vocals development since the bands early beginnings till nowadays, outstanding to say the least! Icanraz ( Abused Majesty, ex-Christ Agony, ex-Hermh,etc.) has contributed allot to the current band status with his dynamic and top-skilled drum performance, proving that he is among the best Polish drummers of today's days! Vraath backing vocals and bass have also brought the band a solid pounding structure! Back into the "Eritis sicvt Devs" times, Starash (guitars) and Turqouissa (synth) have surely left a positive mark on the band! Turqouissa synthesisers provided a perfectly fitting constant dark atmosphere, embracing the music in perfect harmony, something that suited the bands past intentions but isn't properly the best fit on today's more aggressive extreme metal sound, same happened to the programmed drums by the producer Paweł "Wolek" Wolczyk used back then, these ones have perfectly been substituted by Icanraz impressive work! As some use to say, there are two sides to every story, and this more than 60 minutes long album is no different. Two different expressions of Devilish Impressions art can be experienced, while the new tracks "Adventvs Regis" and "Meteoron" reveal a maturely modern extreme metal sound that clearly detach on this album with their own strong and solid structure, in the other hand the 3 tracks from the "Eritis sicvt Devs” (Moon, Var and Dies Irae) reveal a young and experimental sound with tons of black metal influences, a band bright and adventurous enough to create a solid atmospheric darkness, forging by then, the strong pillars of what was to become one of the best bands in the Polish black death metal genre! Without a doubt “ADVENTVS - Eritis sicvt Devs” is a temple of knowledge, founded in a solid unbreakable Polish grounds, a must have release for all Devilish Impressions fans as for adepts of modern extreme metal. This album combines some of the best elements of experimental/atmospheric black metal, ignited by a strong and versatile black death metal hammer, an expression and identity of the bands present times. A piece of musical art wrapped up in a lacquer coating and UV curing digipack with 20-pages booklet adorned by the outstanding art by Black Moon Design (cover + booklet art). “ADVENTVS - Eritis sicvt Devs” album is a timeless journey across the bands ever-growing force of unleashed fury and atmospheric might, unveiling an enchanting dark splendour upon the listeners ears! In fact a mind-liberating piece of art in a phantasmagorical dark musical form. The true light of wisdom has arrived, unleash yourself from the chains around you... raise your head upon the new form of divinity and look upon yourself as the new leader... the new God with the will that shall lead life into immortal freedom!